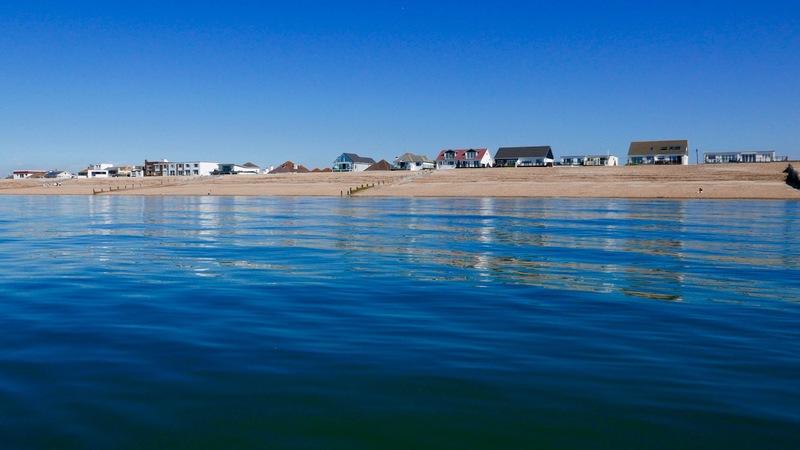 Time to knock out a long-planned circumnavigation of Hayling Island near Portsmouth while this amazing summer lasts! P-Day came along and by chance the weather and tides lined up: high 20s °C with a 3-m neap and a calm morning before a 10mph onshore afternoon breeze. I’d ridden down and recce’d the harbour entrances a couple of years back and last year we’d tried to reach the harbour along the canal from Chichester, but that plan didn’t work out. You’ll find lots of useful descriptions online, but it pays to recall (as I learned on a run to Brighton) that on the English southeast coast the tide (which flows eastwards and ebbs to the west) turns eastwards from two hours before low water to four hours after. So while the water is still dropping the current reverses. 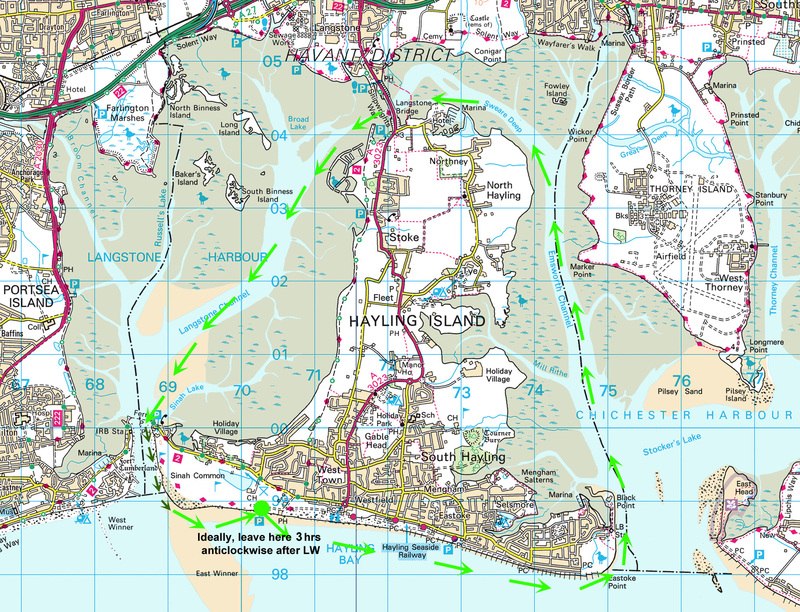 The Brighton post explains it (and I’ve since found an interesting animatable graphic here) and it may also explain why we passed deserted beaches and got to turn north into Chichester harbour entrance (right) surprisingly quickly, even if it was near calm. Occasionally a rogue wake rippled in from a distant freighter out in the English Channel. It was soon clear that my estimation to cover this 22km lap was way too long. S hooting along the channels visible on the map above, mudbanks to left and right limited side exploration and we ended up under Hayling bridge (KM13.5) in just 2½ hours including lunch and a few drifts. On the way we passed a lot of moss-covered sailing boats, lots of birds including oyster catchers (didn’t know you get them down south) and up nearer Northney marina, a brace of SoTs and a young couple struggling to control an under-inflated (or leaking) Sevy K2. Our high-pressure Seawave glided smugly by. With less than half the tide in, there was already plenty of water to pass under the road bridge and between the stumps of the old railway span alongside. 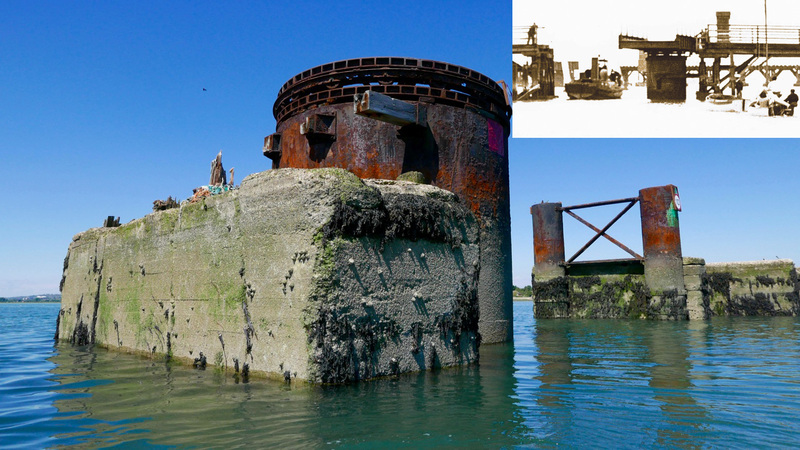 A huge rusting drum suggested a swing bridge to allow boats to pass; online later, sure enough that’s what it was (left, see inset); a railway running from 1865 for just short of a century. When we drove off the island at about HW, it was the drum was only thing above water. 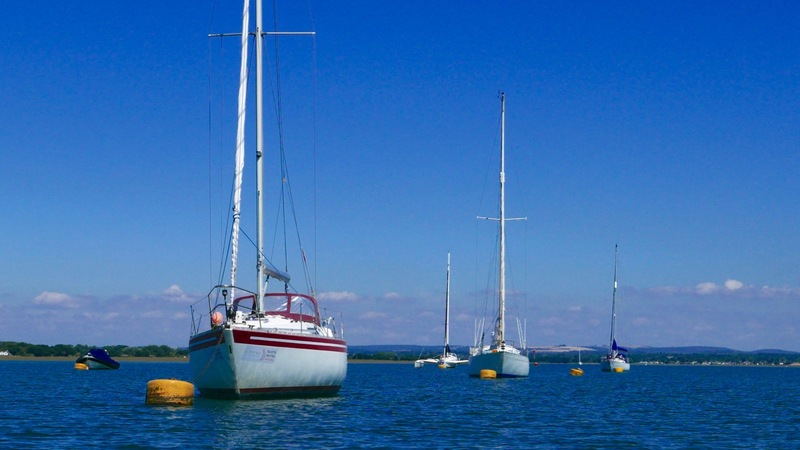 Chichester harbour is packed with parked-up sail boats (‘moored’ some might say); Langstone is virtually empty, possibly because it has much less deep water and a much narrower entrance. These natural harbours formed after the last Ice Age and take about seven hours to fill, but drain in only five. And because they drain right down to unfathomable mud flats on which even a gannet in snowshoes can barely walk, exploring side creeks can only be done with the high water clock ticking. 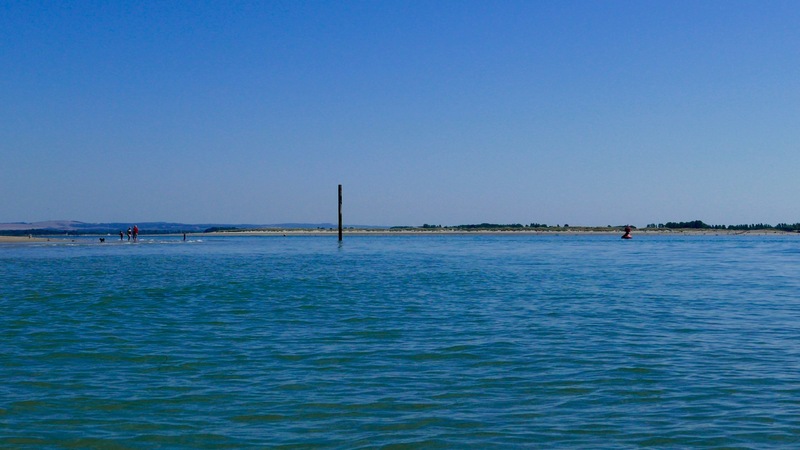 To aim for Langstone exit channel from the bridge, head for two tall poles visible to the SSW. By now the wind was in our faces giving a greater impression of speed, but the tide was coming in for another two hours (or do I add/subtract two hours? My brain hurts). 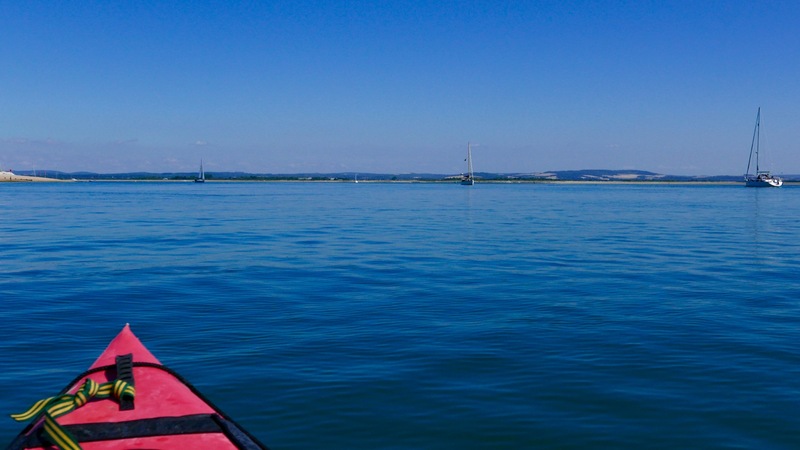 We were way too early to catch a roiling ride out the 250-metre wide Langstone channel back into the Solent. We’d have to hack our way out along the side, like a Maori war party. Long before we got there we could hear the intimidating wail of jet-skis hairing up and down the channel. They have such a bad rep and the two-stroke din doesn’t help endear them. If they sounded like Ducatis or Bonnevilles we’d be queuing up for a go. 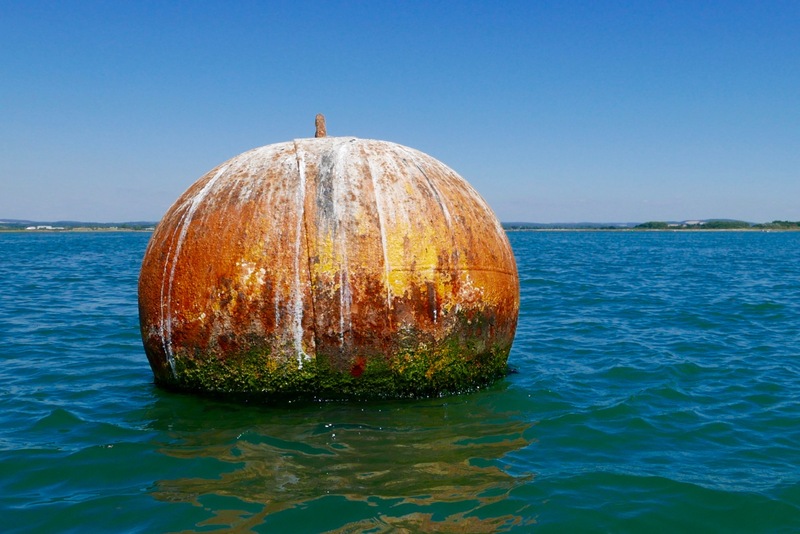 We passed the famous Langstone Pumpkin (left; a lost novel by Wilkie Collins), and soon after, hopping out to wade against the tide over the shallow Sinah Bank saw me sink into the vile black quicksludge which Collins used for the demise of his fickle heroine. Nearing the channel I sought to dodge the in-pouring current by passing under the gantry of the Hayling Island ferry. Then I announced ‘All hands on deck! Prepare for ten minutes of full steam ahead’. That ended up more like twenty, because keeping close to shore was made trickier by frolicking bathers, parked-up jet skis and inflatable goofballs. To the right the tide streamed past way faster than we could’ve paddled, but along the sides we managed to inch forward at a stroll’s pace; a yacht motoring out mid-channel was no faster. I kept eyeing up points where the current might splay out, but it was getting on for a mile out over the East Winner sandbank before the effort eased, the seas slapped us about a bit and we were out in the Solent for a choppy paddle back to the beach (left), now packed with frolicking sunbathers, paddleboarders and inflatable goofballs. Quite worn out, we beached the kayak on and jumped back into the warm sea to wash off the salt and sweat. It’s fun to try new stuff and paddle on a sunny day but overall I’d say round Hayling was a bit boring compared to a sunny day in the Coigach and it’s Northwest Highland backdrop. Who wants to pass Funland and beach houses, mudflats, marinas and more mudflats? Reminds me of Darwin harbour but without the crocs and mangroves. I suspect west of here, the Dorset coast may have more promise. 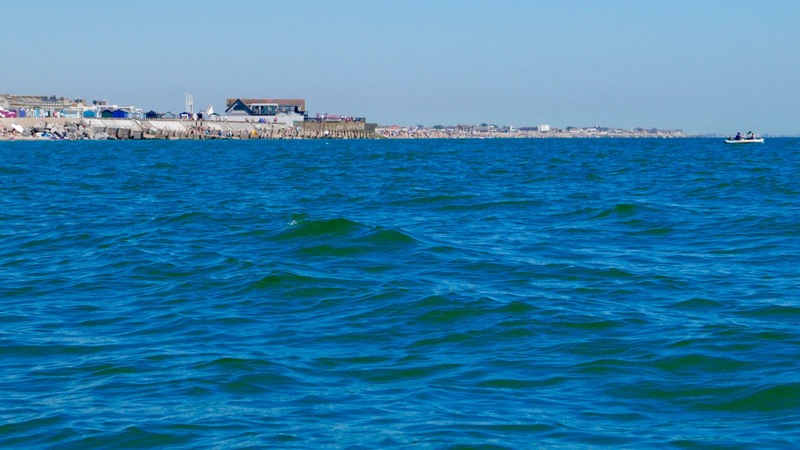 I still think the morning start anticlockwise from West Town is a good idea: knock out that exposed seafront stage before an afternoon breeze (and concomitant rise in bathers, paddle borders and hydrofoil kite boarders hitting the sound barrier). But I’d aim to leave West Town 3–4 hours after LW. 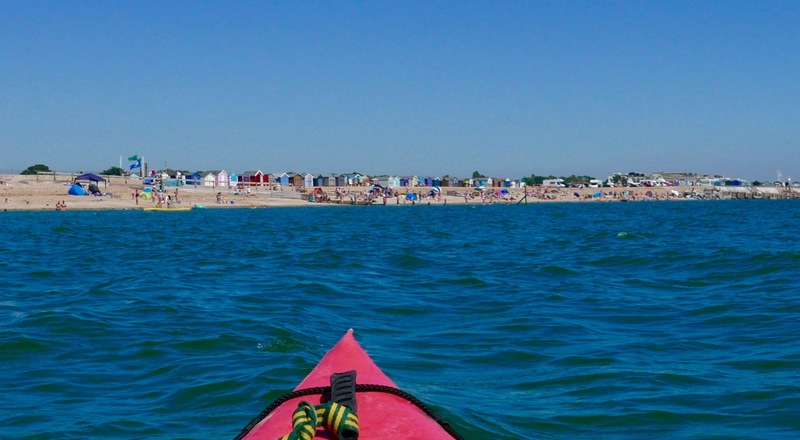 The unintuitive tide may be turning but once in the harbours it gets you up and around to the Langstone exit channel around HW for a short paddle along the seafront back to West Town. There’s probably a formula for doing it clockwise from Eastoke and running the flood tide through the Langstone channel, but I’ll let you work that out. 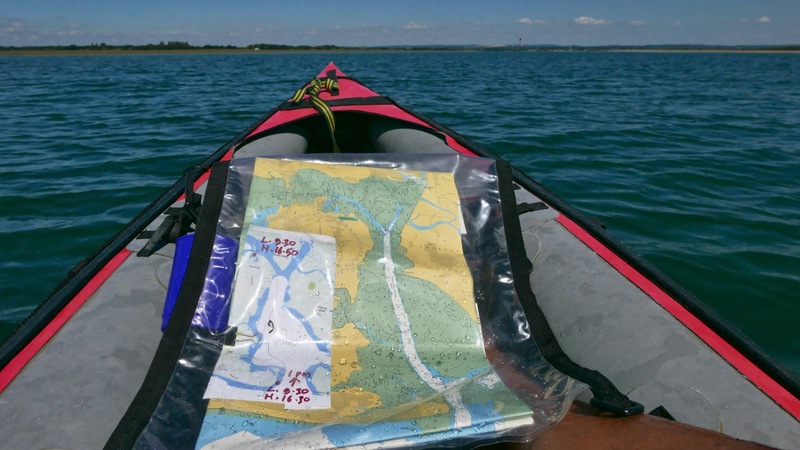 This entry was posted in Gumotex Seawave, Inflatable Kayaks, Travel Reports and tagged chichester harbour, circumnavigation of Hayling Island, Hayling Island, kayaking hayling island, langstone harbour, Langstone Pumpkin. Bookmark the permalink.